An explosive device possibly linked to the bombs that exploded in Manhattan and New Jersey this weekend detonated while a police robot attempted to disarm it. 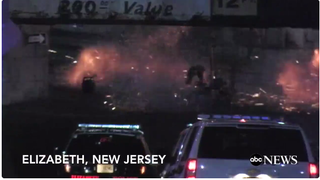 This bomb was found Sunday night in a backpack inside of a trashcan at the Elizabeth, New Jersey train station. The backpack contained five improvised explosive devices. “In the course of rendering one of the devices safe, it detonated. There are no injuries & law enforcement personnel are at the scene processing evidence,” the FBI said in a statement. The discovery in Elizabeth came after a bomb went off in Manhattan’s Chelsea are Saturday night, injuring 29 people. A second device was found hours later a few blocks away. A bomb in Seaside Heights, New Jersey also exploded Saturday morning in a trashcan along the route of a planned Marine 5K run. This morning a citywide phone alert was sent out about Ahmad Khan Rahami, who is wanted for questioning over the Chelsea bomb.